Did you recently start to learn how to sew? Well, if you want to speed up your sewing skills, then follow these simple sewing hacks for beginners. You’ll start feeling confident even after taking a glance at them. 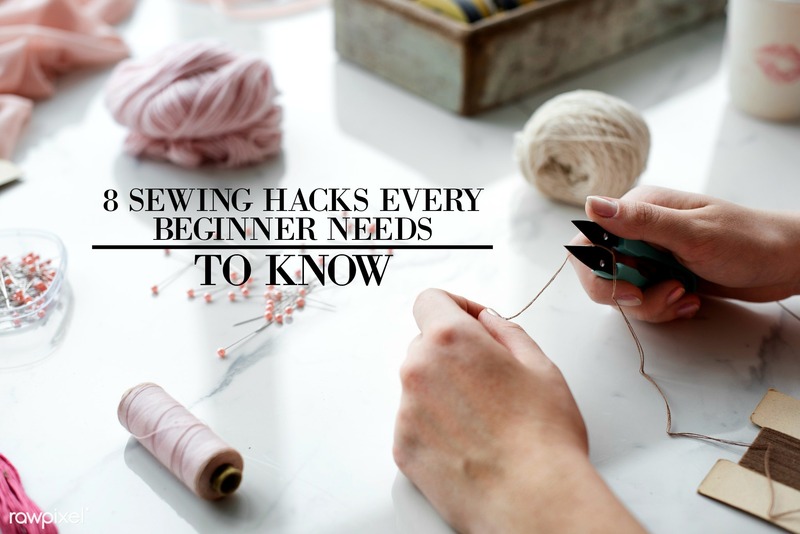 And if you just want to learn something related to sewing then these hacks will also be useful for you. It’ll not only improve your sewing skills, but also make your projects much more manageable than before. So, let’s check out these 8 creative sewing hacks. It’s a painful job, isn’t it? Well not anymore. Have you ever thought about using hairspray to harden a thread end so it can go through the eye of the needle? Now you can save a ton of time! Make the waist of your jeans bigger. Did your pants shrink in the washing machine? Well don’t worry, all you have to do is use a slightly darker denim patch and sew it. The inner belt loop will help hide this patch. Darker patches will draw less attention. How to use larger cones. This one is pretty simple. If you want to use larger cones instead of small spools, then you just have to use a big mug, and use it as a thread stand. How to do perfect hems. If you want to do perfect hems, you can use this technique. Draw a line on your card stock. It has to be at least 1 inch thick from the edge. Place the card stock and fold that fabric. Now press it with the help of the iron. Repeat the same thing for each side, and you can easily create perfect hems like a pro. How to use elastic thread. If you want to create that amazing “smocked” appearance, then you just have to use elastic thread, especially in the bobbin of the sewing machine. All you need is matching thread, elastic thread, and of course fabric. How to keep your scissors working. Forget those frustrating dull scissors. Just wipe your scissors with a dry cloth after every use, and never cut pins with it. These hacks will keep your scissors sharp all the time. How to cut slippery fabric. This one is a bit tricky. If you are an experienced person, then you know how tough it can be to cut slippery fabric. And to do it, you just have to put some muslin under that fabric and you can do it easily. Just use a hair straightener! Do you have a hair straightener? Then your problem is solved. You just need to use it if you find the iron is too big for shirt straps or small hems. These are small tips and hacks that’ll help you out as a beginner. With the help of these tricks, you can start on your new project. So, if you find sewing is a bit tricky, then don’t forget to practice these hacks that’ll make it easier!